AWT Exceptions and Errors gives the introduction to Error and Exceptions. The AWTException occurs during an exceptional condition. 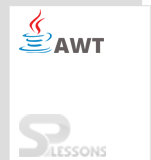 AWT classes cannot throw exception, however, the sub-classes of these classes throws the exceptions. For AWT Exceptions that occur during run-time, Exception class is the super class. public AWTException (String message) This consists a message that gives the information about the exception occurred. IllegalStateException is the super class for this Exception. 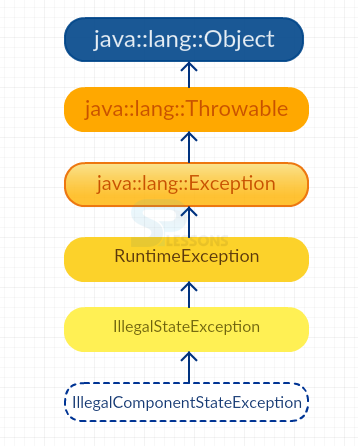 IllegalComponentStateException is a run time exception and can be thrown only in 3 positions. When setCaretPosition() is called before the existence of component’s peer. When getLoacle() is called without its existence in the container. When getLocationOnScreen() is called without having any components on the screen. Using these is not illegal. Instead, these methods should be called after the completion of a particular task. public IllegalComponentStateException(): This constructor does not provide any message about the problem occurred. public IllegalComponentStateException(String message) : This constructor gives the detailed information of the generated problem. This message can be obtained by using the getMessage() method. Error is the serious case to be noted while working with AWT. The AWTError is the sub class of Error class and occur at run-time. If these errors are not caught, then the compiler terminates the program. This functionality can be used in AWT sub-classes and does not require any class file for generation. There is no need of methods as it automatically directs to the top level of the system. Exceptions occur at run-time and caught by error handling methods. Java Exception class is the super class to all the AWTExceptions. Exceptions provide the messages giving the information of the exceptions occurred. Java Error class is the super class to all the AWTErrors. Critical errors must be shown to the user. However, aborting application is not required because terminating a single function skips the remaining functions to work.